The intricate grooves on this small embossing rolling pin put ornate patterns on your baked goods. Lighter and shorter than a regular pin so that a kid can get a good grip on it. Each heirloom-quality pin is made from laser-cut Beech wood. You’re only a roll away from giving your treats a professional-looking finish. Loved the novelty of it. Works good on the dough but some of the design is lost when dough cooks. But would still buy again. Love it--tried it once so far on cookies and can't wait to try it again. Here in Houston, snow is rare and welcome! 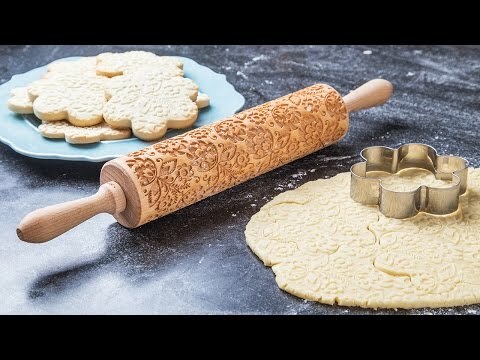 When I saw the snowflake embossed rolling pin, it seemed perfect for Christmas baking! The small size was perfect for grandkids hands. Cookies turned out as cute as could be, and as a bonus we even actually got about 2 inches of real snow a week later. The outdoor snow may not be here next year, but the snowflakes are a guaranteed pattern for dozens of cookies! Probably gives a good massage too! I bought the big and little roller and love them both!